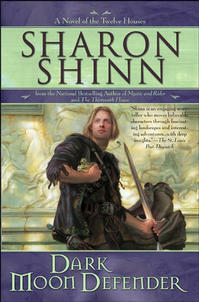 This is the 3rd in Shinn's Twelve Houses series. The 2nd, Thirteenth House, came out this past March, so when I found out DMD would be out in October I squealed in delight. It's so rare to get more than one book per year out of a new series in hardback and I love this series. The six companions are each so different and intriguing that it's a pleasure to watch them interact. They really are old friends by now. The first two books followed Senneth and Kirra respectively, the two females in the group. This one focuses on Justin the gutter boy turned King's Rider. Warning: the dude on the cover looks nothing like Justin. The 4th book is going to focus on Cammon and is, without a doubt, going to rock my world. This is the 2nd in Harris' Harper Connelly mystery series. I surprised myself with how much I was looking forward to it. Harris' Sookie Stackhouse series is her most popular and they are delightful. But I am much more like Harper than I am Sookie and so it is perhaps not so surprising that I looked forward to the continuation of her story so much. And the lack of supernatural (aside from Harper's uncanny ability to find dead people) elements is almost refreshing after Sookie's wild world. One major (for Harper) revelation in this book has me on the edge of my seat for the next one. This was a recommendation from a friend whose literary taste is so similar to mine, it's kind of a crime that we've never actually met. The description on her blog had me intrigued, so I picked it up and took it on a transatlantic flight to Morocco. Despite the fact that it didn't last me a third of the way there, it was so worth it. What a sweet story and how much I wanted to sit in cafes with Ellen, James, and Link and just be intellectual and chummy with them. And like Ellen, I think James is super cute! I finally picked this one up after hearing mixed reviews. I was going on a trip and trips always make me want to read stories set in exotic locales. I read it while holed up in a hotel in Agadir, sick from drinking some bad water. It got me through. I thought Geras did a great job weaving the lives of mortals with those of the gods manipulating them. The story follows three young women and one young man who live in Troy and who don't remember a time when their city was not beseiged by the Greeks. As with the original, tragedy and joy walk hand in hand, the outcome is bittersweet at best, and at times you want to shake the protagonists. But the writing is lovely and as soon as I can afford it, I'll pick up the sequel, Ithaka. Another great Russell-Holmes pairing. This is the one I've enjoyed the most since #2--A Monstrous Regiment of Women. It had been awhile since I'd picked one up and now I'm completely back in the mood. This was brought on by last month's reading of The Well of Shades. It's just so hard to follow a Marillier up with something else. Some lesser book that actually isn't a lesser book but will seem so on the heels of a particularly good Marillier. It's not fair. It's not fair to you and it's not fair to the book-that-is-not-lesser. There's really only one solution to the problem. Read an older, much beloved Marillier. Soak it up, revel in it if you must, get it out of your system, and move on!